There are leaks and then there are leaks, this one being the latter, italicized version. 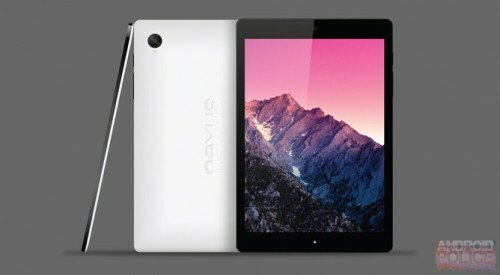 We’ve known that HTC is making the new Nexus tablet, which will be an 8.9-inch, high-end affair. We also know that it might be called Volantis or Flounder. Now we know a lot more about the Nexus 9, thanks to a tipster that gave new info to�Android Police. The Nexus 9, as it’s known in some circles, features an 8.9-inch display with 2048 x 1440 resolution, 281 pixels per inch and 4:3 aspect ratio, a 64-bit NVIDIA Logan processor, 2GB of RAM, 16/32GB of storage (depending on model), 8-megapixel camera with OIS, 3-megapixel front-facing camera, stereo front-facing speakers, and likely Android 5.0. The Nexus 9 tablet measures 226.3 x 152.9 x 7.9 and the Wi-Fi model will weigh 418g while the LTE model weighs in at 427g. There will supposedly be a high-quality build of the tablet that includes aluminum zero-gap construction and tapered sides. The tablet won’t be cheap. 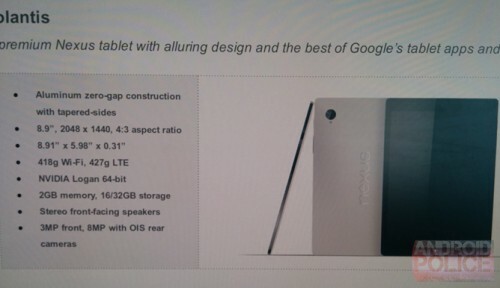 The Wi-Fi-only versions of the Nexus 9 will run $399 and $499 and the LTE models will obviously be more expensive. The Nexus 9 is expected to launch in the fourth quarter of 2014 and be the debut device for Google’s upcoming Android “Lollipop” OS.